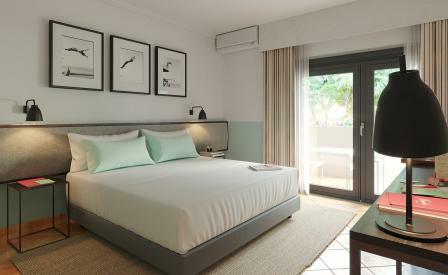 With its neon signs and pastel pinks, its pop-yellow parasols and turquoise tones, the newly arrived Magnolia Hotel adds more than a splash of colour to the umbrella pine and white-washed landscape of Quinta do Lago. Interiors by London’s Bryan O’ Sullivan Studio perfectly play out the glory days of the 1950’s American motel with the cheerful, retro-vibe striped ceilings, cinema light boxes, and black and white photographs of swimmers in a mid-air dive. Set over low-slung two-storey building, which firmly follows through with the motel aesthetic, 74 clean-lined guestrooms with pink or turquoise trim have ultra-comfortable beds, and marble clad showers. There are also seven wooden cottages, also in varying pastel colour, that have kitchenettes and sitting rooms off the bedrooms. Affordable pricing is aimed at the millennial market as is the young, fun, take on hospitality with midnight toasties and a music centric cocktail bar with a weekly DJ in the summer months. There is a heated swimming pool, a small spa, a games room and Dutch bikes to borrow. Food from Tom Briggs, ex-Soho House, is all about tacos, and burgers with a few Asian-accented healthy options for good measure.